I am always slightly dubious when purchasing a teeth whitener as i’m never sure they actually work and with the added worry that it may cause my teeth to become sensitive. So to my delight i have finally found a non abrasive toothpaste which also has visibly whitened my teeth! BlanX formula claims that it whitens your teeth from the first application,thanks to daylight. This product comes with an LED light which you attach onto the toothpaste, When you squeeze the toothpaste out the led light works by activating the ActiluX in the toothpaste. As this formula remains on your teeth all day,it then reacts to daylight which whitens your teeth naturally,causing no sensitivity to the teeth. 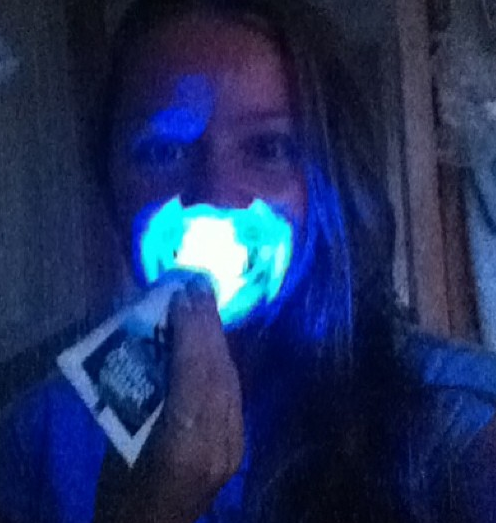 The LED light accelerator can also be shone on your teeth after brushing for a whiter result. Sorry about the awful quality of this picture,i just wanted to show the LED light in action! I purchased this from Boots for £7.49 however it is no on offer for £5.62 online. I have been using it for a month almost so i have had enough time to see if it works for me. I used this twice daily and from a few days in i noticed a small difference in the colour of my teeth, now 4 weeks on i have noticed that my front teeth are visibly a shade lighter or two which i am thrilled with. The toothpaste also doesn’t have a nasty taste to it like most teeth whiteners i have tried have and the tube has lasted me a month so far and there is still some left. It is definitely value for money and as i previously mentioned sensitivity on my teeth and the wearing down of the enamel is a concern for me and others i am sure, so i definitely recommend this product and it has left me with visibly whiter teeth! BlanX do more in their range of teeth whitening products and i am tempted to try the BlanX white shock with LED bite next! Have any you tried this product or any others from the Blanx line?